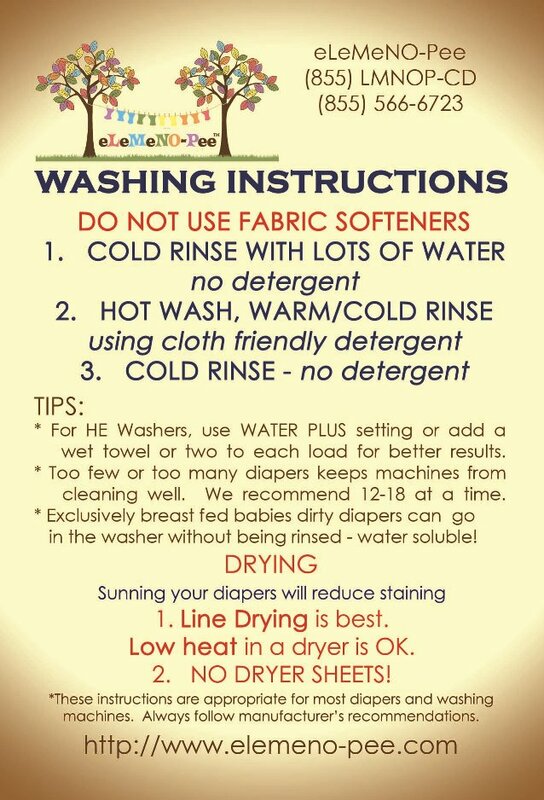 eLeMeNO-Pee recommends a very basic wash routine for your cloth diapers. Our instructions are appropriate for most people, however water issues and the specific detergent being used will affect the usefulness of this recommendation. If you are having laundry issues with your cloth diapers, contact your local consultant or call us toll free at (855)-LMNOP-CD. We also have these convenient reminder magnets available from your consultant if you need a little reminder every once in a while. 3. COLD RINSE. No Detergent. -Too few or too many diapers keeps machines from cleaning well. We recommend washing 12-18 diapers at a time. You should experiment with your washer/water/detergent to find what is best for your setup. -Exclusively breastfed (EBF) babies have water soluble poop. These diapers can go directly in the washing machine without being rinsed.